Arises, features and stops can be formed with the use of purpose made UPVC profiles. Proprietary beads are available for detailing angles, pre-sealed movement joints and both stops for vertical and horizontal bell cast details. A variety of manufacturers offer profile beads in various colours, so it is generally possible to use a bead in a sympathetic colour to the Weber render. Render profile beads are available in a number of sizes to suit the render specification. 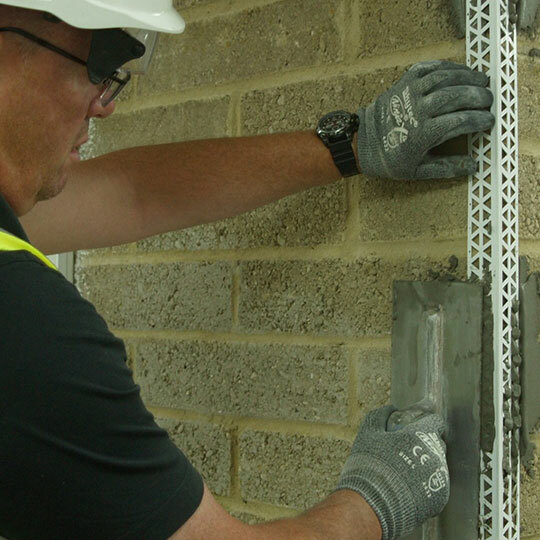 The thickness of render is dependant on the exposure of the building to which the render is to be applied. In brief, the minimum finished thickness of render should be no less than 15mm for sheltered to moderate exposure areas and 20mm for severe. Please note that insufficient thickness of render will prevent the ability of the render to provide the required weather resistance and protection. Problems such as ghosting of the substrate mortar joints may become permanently evident in the render finish. In addition a lack of thickness may well have a contributing factor in algal growth staining. In most cases it is best to fix the beads into dabs of weberend bead adhesive, which gives the applicator the ability to align the beads to the desired level and thickness. This is particularly critical if a render bead is used with a lesser profile projection than the required render thickness eg. a 10mm bead can be used with a 15mm render providing that the bead is fixed to allow for sufficient render thickness. Some contractors prefer the assurance of using beads that are designed at the render specified thickness as to eliminate any on site risks. This would have to be the case if mechanical fixing is the preferred fixing method. It is not good practice to fix the beads by just trowelling weberend bead adhesive over the wing of the bead without having a dab of material behind the bead. This method will not securely fix the bead in place and will lead to a weak detail. The fixing material should be done with the use of weberend bead adhesive, but weberpral M render or weberend aid would also be suitable for fixing beads. In no cases should internal fillers or adhesives be used for this purpose.